A pressure washer is likely the best way to remove stubborn dirt, animal droppings, gum, moss, algae, and stains. A pressure washer uses an incredibly high pressure stream of water, which acts like an abrasive. Yes, moss can be removed with harsh chemicals or some serious elbow grease, but removing moss from aggregate concrete or other materials might actually be done more effectively with a pressure washer. You can purchase gas-powered or electric pressure washing machines at a store like Lowe’s, or you can rent a machine or hire a pressure washing professional. If you are regularly keeping up with moss removal, or have a small property, you might only require a light-powered machine. If you have several hours of work, stubborn moss issues, or are planning on sharing a machine between neighbors, it might be a smart idea to invest in a high-quality machine. That depends on how much time and effort you want to invest in the task, and the equipment. Some homeowners choose to do their own pressure washing, others would rather sit back and enjoy a cold drink while their moss problem is blasted away. 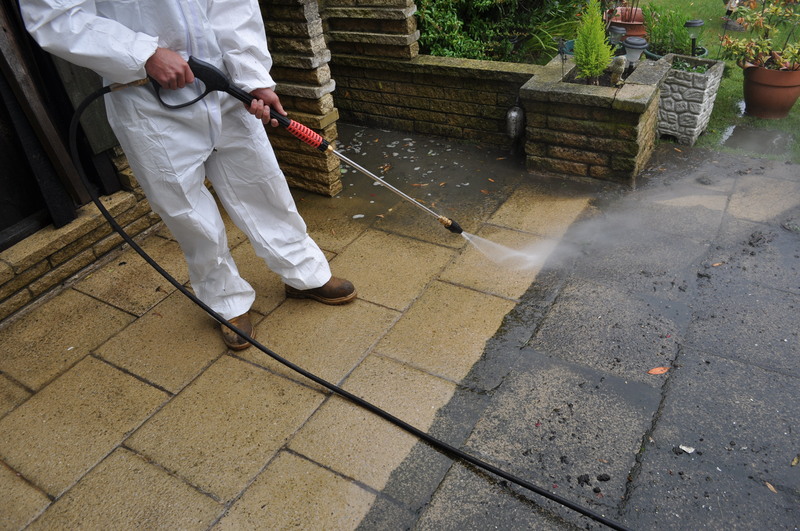 Pressure washing isn’t a highly skilled task however it does take some physical exertion. If youre intending to pressure wash a large area, then you should really consider a pro. Pressure washing can literally strip paint from exterior siding, splinter fences, remove shingles from a roof or ruin your landscaping. If it’s your first time pressure washing, you’ll want to be very careful and avoid trying to pressure wash anything that isnt concrete.There are a few types of outdoor furniture that can withstand pressure washing, but others could be completely damaged. If you aren’t sure, you can test a very small area, but use caution. It’s generally not recommended to pressure wash roofs (except for metal roofs), wood or painted surfaces. Eye protection is a must, you will likely have bits of debris, pebbles, and sticks flying around, and that is something you dont want in your eyes. Non slip, water resistant shoes are also a good bet. If you are using a gas powered machine, use caution when operating and be aware of the carbon monoxide being produced. Some people prefer to wear protective ear plugs as well as prolonged exposure to loud noises can damage your hearing. Always read the operating manual to ensure that you are using the right type of gasoline and oil as well as properly maintaining the machine. Oh, and avoid pressure washing your skin or the skin of anyone around you. Remember, the stream is strong enough to splinter wood, imagine what it can do to skin!